A week ago one of the days came that eventually arrive in the farming year, and when they do I am always surprised by the relief I feel. Our roasting chickens went to the butcher last Friday with my husband, and mid-afternoon we had a visit from our favorite livestock haulers who took the pigs to the butcher as well. That night we did a little happy dance and got to toast the end of another season of work. The meat in the freezer is such a great feeling and even though we love the animals that it comes from, when those chores are no longer front and center, it sure is a good feeling. 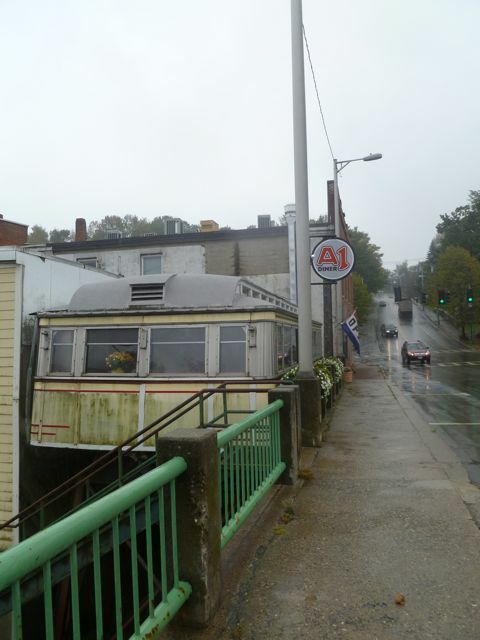 On Saturday we went to pick up the roasting chickens at the butcher in West Gardiner (Weston’s Meat Cutting) and on the way we stopped at the renowned AI Diner in Gardiner to have some breakfast. It was raining and I didn’t think of taking a photo until we were just about on our way out, but we enjoyed the morning immensely (the food is lovely, too!). It’s nice to get in the truck and not be able to do anything but knit and chat and watch the seasonal changes in the area as we drive through. I am so often caught on my little hamster-wheel of off to work in the dark to rush right home to chores and dinner, without taking a different route. It’s certainly nice to turn left instead of right some days! 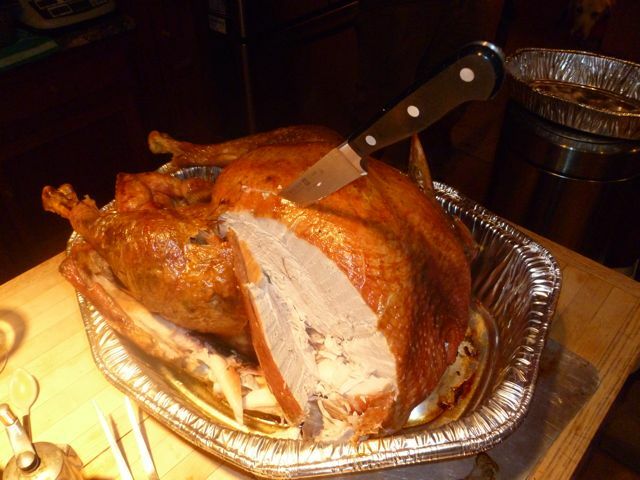 Thankful for the lovely Thanksgiving weekend, amongst many other things. 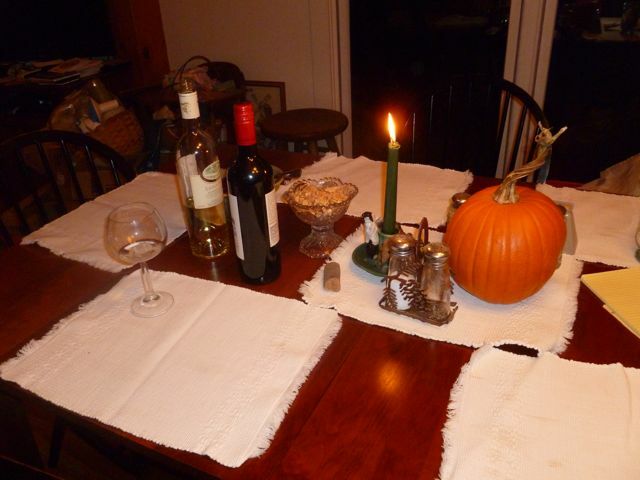 We shared a truly wonderful dinner with our son, grandson and our neighbor Susie. Once dinner was on the table, I totally forgot to get the camera out, but I did remember to take a picture of the almost-set table and the turkey! For one of my favorite books in the world: A Wrinkle in Time. 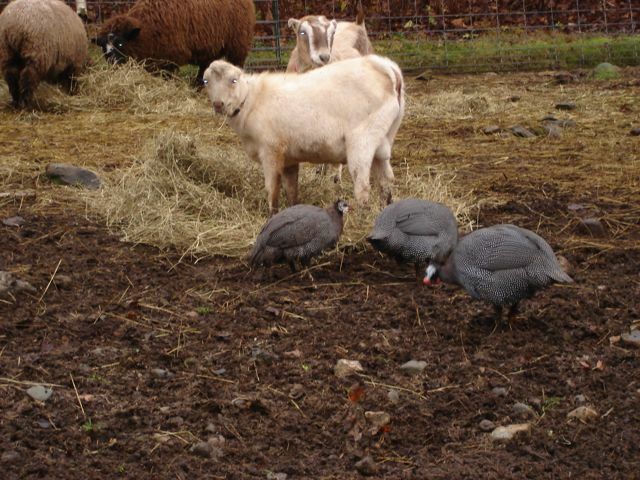 And I know it’s far-fetched, but our three guinea hens are named after the 3 wise women or witches in the book. Mrs. Whatsit, Mrs. Who, and Mrs. Which. They are all that are left of our brood of 16. Mrs. Which, the last one in line, is sporting a broken right leg, thanks to the last dog attack that these hens survived. To have lasted this long, hopefully they are the smart ones (!) and they seem to know where to go to get shelter and to get the food that I leave for them, as well as scrounging for the leftover grain that the sheep and goats leave. They are very funny and when they aren’t around I miss them and their calling. When we got the keets as day-old chicks they were quite the challenge. They were able to get out of almost any enclosure, and right at the start Josie the Jack Russell ate one that had escaped. She went on to have a field day with the guineas, and whittled their numbers down to just 5. They weathered another attack by a local dog, and Mrs. Which ended up with a mangled leg. And so we have the 3. I leave feed for them in one of the greenhouses and they do take advantage of it. They roost in by the sheep in one of the other greenhouses and are on the move during the day through the weeds and the undergrowth. I hope that we can keep these guys healthy through the winter. If one of them turns out to be a male, maybe we can get some eggs and hatch them out. They are really beautiful birds and hopefully they are helping us rid the area of ticks and other troublesome bugs. And it’s amazing how tolerant the sheep and goats are of them! Day two of roaster chickens is over. 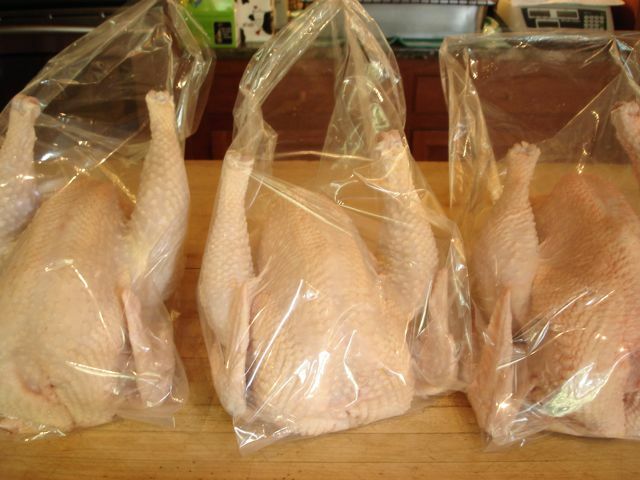 I took the second group of birds to the butcher yesterday. John had a day of work, but he helped me get them crated so I didn’t have to kill myself before I even got out of the driveway! It was a much more easy-going day than our first appointment a week ago. There weren’t as many of us lined up, and those of us that were there didn’t have any really huge numbers of birds. So things went smoothly and I was home by 1:30 for the washing, drying, inspection, bagging and tagging! 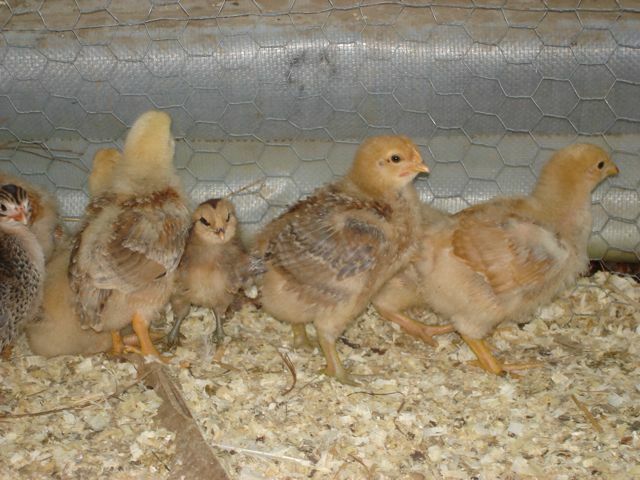 The chicken world is moving along at quite a click here at Ruit Farm. The new breed of roasters that we have, the Freedom Rangers, are supposed to grow more slowly than the white Cornish cross that we usually raise for meat. These Rangers are meant for pasture, and we have been getting the space ready for them. Meanwhile, they are all feathered out, and they do not appear to be growing more slowly than the Cornish. We have actually changed our butcher date to accommodate this, but I am still totally amazed. 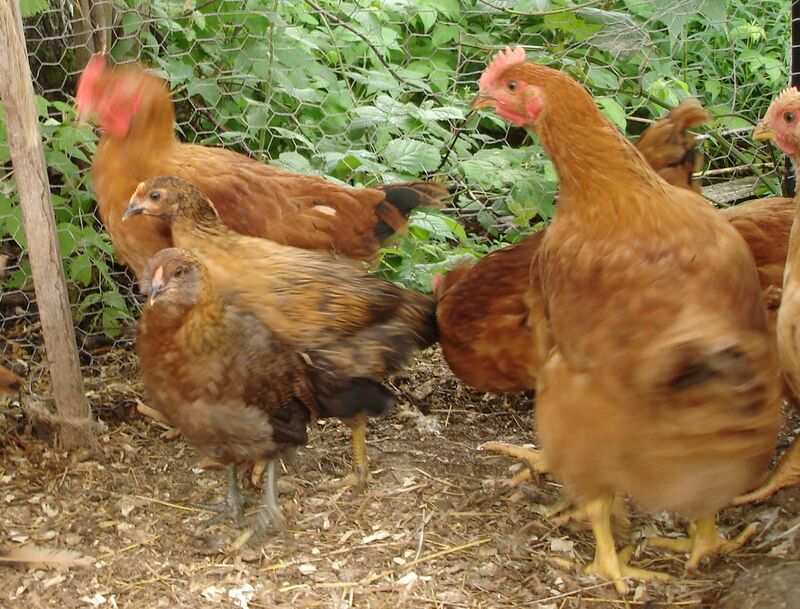 These chickens are a lot of fun, they are active and really good at foraging. Our Araucana pullet in the picture is the same age as the roasters. That girl really gives me a chuckle… she looks so much like an eagle that she always surprises me in the greenhouse. The other layers are just as pretty, and the Wyandottes blend in with the roasters well. 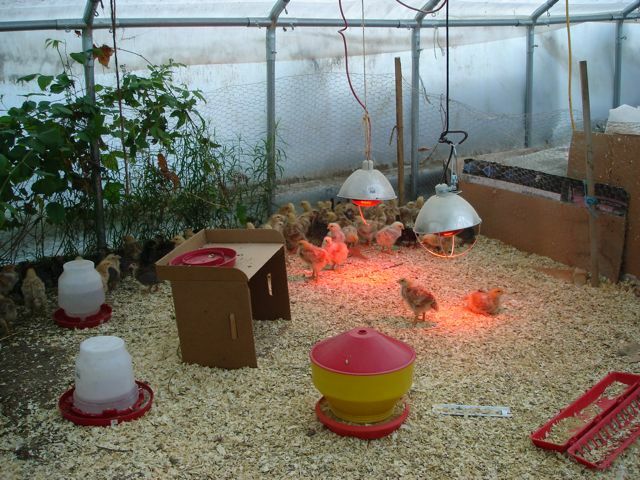 The roasters, guinea fowl and layer chicks are all having a grand time in their greenhouse. Feathers are busting out all over, and they are not needing the lights on as much during the day since it’s been so much warmer. The roasters are heads taller than the laying hens now since they’re hard-wired to grow much more quickly. 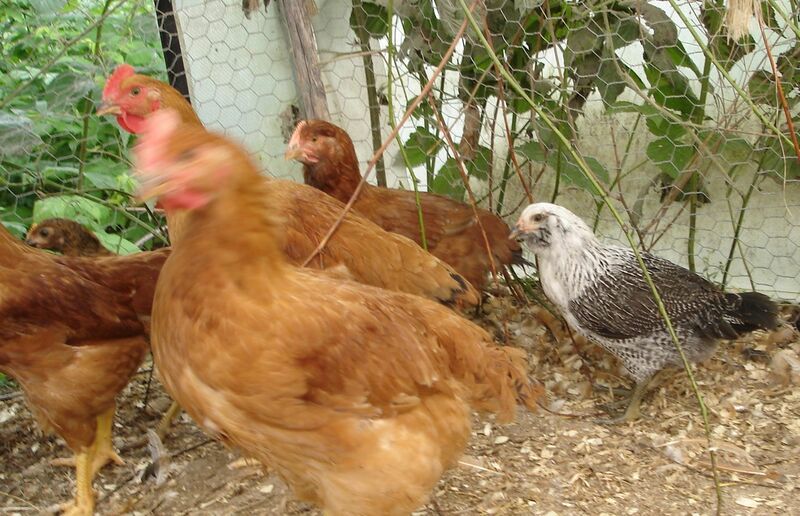 In the picture below, a few roasters are lined up with one golden-laced Wyandotte hen peeking out from between. John is already counting the days until eggs! Even more chicks have come to the farm. We have not had any laying hens for quite a few years now, and even though we have friends who always have fresh eggs available, we really missed having our own. Since we are brooding the guinea keets and the roasters, our friend Pam at Hatchtown suggested that we just brood a few more and get that taken care of! Not wanting to order 15 or 25 hen chicks from a hatchery, we were able to get some from a local farm. Pam knew that they would be approximately the same size at this point. 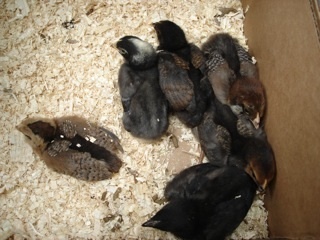 We *think* we have: 2 Araucanas, 2 Golden Laced Wyandottes, 1 Black Sexlink and 1 Barred Rock. We brought them home and placed the box they were in on it’s side so that they could make their own decisions on when to step out into the hopping mass of roasters and keets. The Black Sexlink shot right out of the box and immediately blended in with the big bunch, but the others were less anxious. Finally one or two more took the plunge, but 3 remained in the corner, having a little nap. Two of the roasters decided that the box looked like a cozy place in which to take up residence and set themselves to ousting the three hens. John and I stood there laughing as the big bully kept trying to put his head under the hens and push. We really think it was a roaster rooster, because every once in awhile he would come out of the box, spread his legs apart, fluff himself up, flap a bit and stretch his neck out. A lot of posturing, and then he would turn back to the job at hand. While we stood there, he never did get the hens out of the box. They sat there together with their eyes closed tightly, ignoring the whole onslaught. Every once in awhile, another roaster would come along and goose the roaster-rooster who was busily at work, and he would get all upset and have to start over. 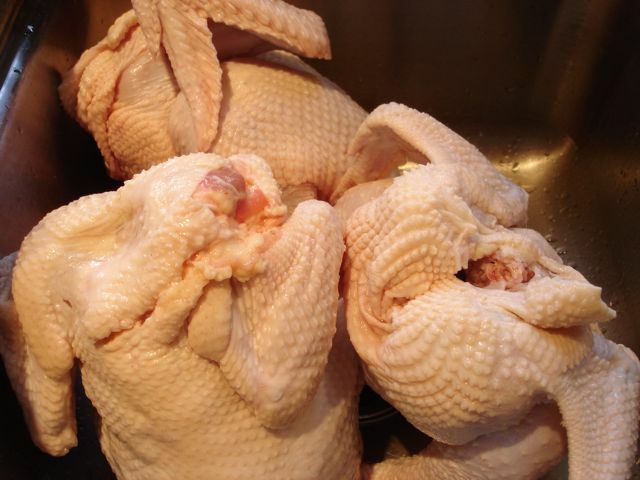 Later on in the afternoon when we checked on them again, there were a few hens and a few roasters napping in the box. I guess they have made their peace and they are willing to share the chicken world’s newest prime real estate!